Two harrowing crashes . . . A vanished rescue plane . . . A desperate fight for life in a frozen, hostile land . . . The quest to solve a seventy-year-old mysteryThe author of the smash New York Times bestseller Lost in Shangri-La delivers a gripping true story of endurance, bravery, ingenuity, and... read more honor set in the vast Arctic wilderness of World War II and today.On November 5, 1942, a U.S. cargo plane on a routine flight slammed into the Greenland ice cap. Four days later, a B-17 on the search-and-rescue mission became lost in a blinding storm and also crashed. Miraculously, all nine men on the B-17 survived. The U.S. military launched a second daring rescue operation, but the Grumman Duck amphibious plane sent to find the men flew into a severe storm and vanished.In this thrilling adventure, Mitchell Zuckoff offers a spellbinding account of these harrowing disasters and the fate of the survivors and their would-be saviors. Frozen in Time places us at the center of a group of valiant airmen fighting to stay alive through 148 days of a brutal Arctic winter by sheltering from subzero temperatures and vicious blizzards in the tail section of the broken B-17 until an expedition headed by famed Arctic explorer Bernt Balchen attempts to bring them to safety.But that is only part of the story that unfolds in Frozen in Time. 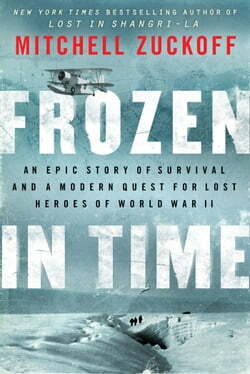 In present-day Greenland, Zuckoff joins the U.S. Coast Guard and North South Polar a company led by the indefatigable dreamer Lou Sapienza, who worked for years to solve the mystery of the Duck s last flight on a dangerous expedition to recover the remains of the lost plane s crew.Drawing on intensive research and Zuckoff s firsthand account of the dramatic 2012 expedition, Frozen in Time is a breathtaking blend of mystery, adventure, heroism, and survival. It is also a poignant reminder of the sacrifices of our military personnel and their families and a tribute to the important, perilous, and often-overlooked work of the U.S. Coast Guard."